Menlo Grill Bistro & Bar is closed for renovation and will re-open in early 2019 as the Menlo Tavern. Limited seating in the Courtyard is available to hotel guests for breakfast, lunch and dinner. 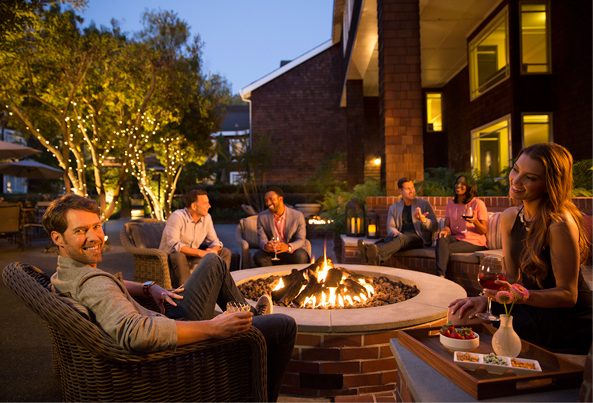 Tucked away in the tranquil grounds of the Stanford Park Hotel, Menlo Grill Bistro & Bar is a classic American grill with a warm, inviting local vibe that fits right in with its Stanford University locale. Unpretentious and under the radar, this Palo Alto restaurant is a Silicon Valley favorite—a place where ideas are hatched and deals are done. From our outdoor patio to our more private indoor spaces, Menlo Grill invites you to enjoy casual yet sophisticated dining that pays homage to the American culture cultivated in the most prestigious college and university towns. A variety of enticing menus are inspired by the art of the home-cooked meal. High-quality comfort foods highlight regional, seasonal and sustainable ingredients. Rivaling our award-winning cuisine is our popular mixology program, offering an array of craft cocktails that combine a classic perspective with an innovative spirit. Our extensive wines by the glass and craft brew menu pair perfectly with our cuisine. Gather for a power lunch with colleagues or linger for a late brunch. Dine and rub elbows at dinner with Silicon Valley’s most elite minds. Or stop by the crackling fire pits for a sweet treat and a cocktail under the stars. Settle into a neighborhood gathering place, where the access and the ambiance are effortless. Through October 2018, the Menlo Grill Bistro & Bar will feature live music in the courtyard every Wednesday, Thursday and Sunday from 6:00 to 9:00 pm and Friday and Saturday from 5:00 to 9:00 pm. Featuring local artists; Dave Cimmen, Jimmy Ashley, Lucas McLaughlin and Simon & Paul. Craft beer, a full bar and award winning menu complete the scene. Large party and fire pit reservations available.